Anger is a messy, complicated emotion. The person or situation that angers you and the thing that sets off your angry reaction can be completely separate. You may not even know that a connection exists. For instance, you stub your toe while carrying plates to the dinner table. Your first reaction may be a range of expletives, which is a direct response to the physical pain. Then you spend the entire dinner stewing with rage. Why? The quiet, simmering anger you feel isn’t the fault of the door you ran into or the fault of your poor, throbbing toe, it’s caused by emotional pain. Perhaps it’s the pain of feeling unappreciated by the people you’ve cooked for or the pain of having no one to cook for. You could spend years not knowing that the trigger (family dynamics, loneliness) makes you feel angry. The connection between what angers you and your expression of anger can be like a tangled knot. Untangling anger is a process of self-exploration and self-discovery. As a practicing marriage and family therapist, every day I help people untangle their anger by helping them uncover their triggers. 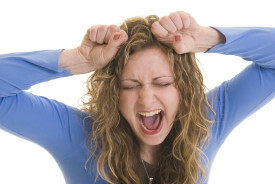 Threats to your boundaries and feeling offended or insulted are common anger triggers. Your anger may also be a response when your basic emotional needs are not met by significant others in our life. Other triggers include: situations that you feel are unfair or unjust; actions that cause you to feel disrespected, hurt, frustrated, or disappointed; and things that simply irritate or annoy you. Once you know what makes you angry, the easier it’ll be for you to recognize the link between the trigger and your angry reaction. The deeper you delve into the inner workings of your own mind, the more likely it’ll be that you can stop an angry reaction from happening in the first place.